This article is about the minifigure. For the hat, see Part:x1800. 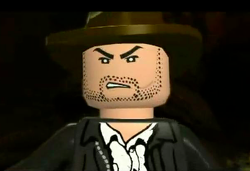 Fedora is a grave robber who appeared in a flashback in the third installment of the Indiana Jones franchise, The Last Crusade. In the end of the whole battle Indy gets the cross from the goons, but they get it back through the law. Fedora gives Indy his hat, as a reminder of their well-fought battle. Fedora looks and moves exactly like Indiana Jones, but with black hair instead of brown hair, a black leather jacket, a dark brown hat, and no whip. Though in the film he passed his hat on to Indiana Jones, in the game it is a darker hat, indicating that the hat's colour has faded over the years. Fedora is the nickname of the Garth. In the portable versions of LEGO Indiana Jones 2: The Adventure Continues, he has a whip instead of a gun.